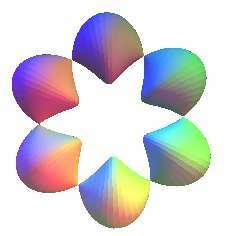 The first kind in the case k = 1/2 was studied in 1947 by Maurice El-Milick, surface that he called "one-sided cyclide". 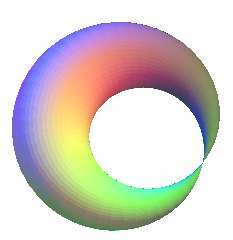 Cartesian parametrization: , for a surface tangent to the classic torus with major radius a and minor radius b.
Cylindrical equation for k = 1/2: . 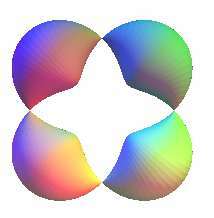 The sine tori of the first kind are the surfaces generated by the rotation of a variable ellipse around an axis, with the ellipse located in a plane perpendicular to the axis, and one axis of the ellipse remaining constant while the other varies sinusoidally. 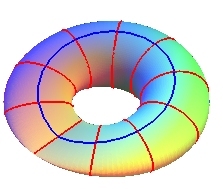 We obtain a 3D immersion of the Klein bottle for k = 1/2 and a > b > 0; the principal vertices of the generating ellipse describe two circles and the secondary vertices describe a Viviani curve (in blue opposite). 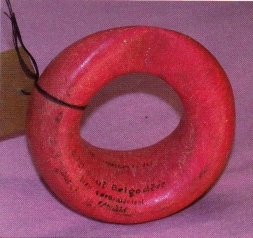 Opposite, the model made in 1947 by Maurice El-Milick, preserved at the Institut Henri Poincaré. In the case b = a, still with k = 1/2, the surface obtained is none other, up to scaling, than the cross-cap. 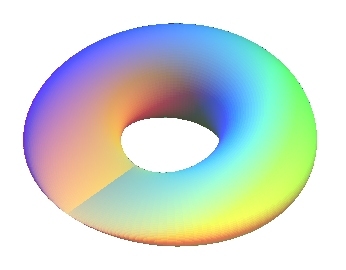 The removal of the central hole made the genus decrease by 1, and therefore we got from the Klein bottle to the projective plane. For any k, the secondary vertices of the ellipse describe one or two cylindrical sine waves with parameter k.
The sine tori of the second kind are the surfaces generated by the rotation of a variable circle around an axis, with the circle on a plane perpendicular to the axis, and the radius of the circle varying sinusoidally; in other words, it is a tube the bore of which is a circle with radius that varies sinusoidally. 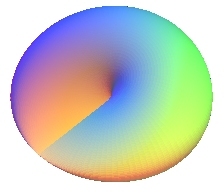 For k = 1/2, we get the surface with one conical point called "pinched torus". 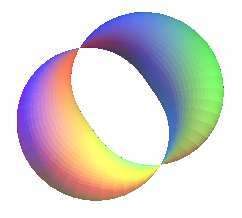 (for the first one, the projection on xOy is delimited by a limaçon of Pascal with a loop, whereas for the second one, it is delimited by two tangent circles).